What was the firing range? Kinda failed my comprehension there. Anyway, good stuff! Makes me itch my "buy a rifle" finger. I'll be hitting the range today after work. The village of Shiocton near me has a beautiful municipal range. $5.00 per visit, unless you spend $30 for a year pass. Should have gotten the pass, as I passed 30 long ago this year. Funny, as I didn't get out even once last year. 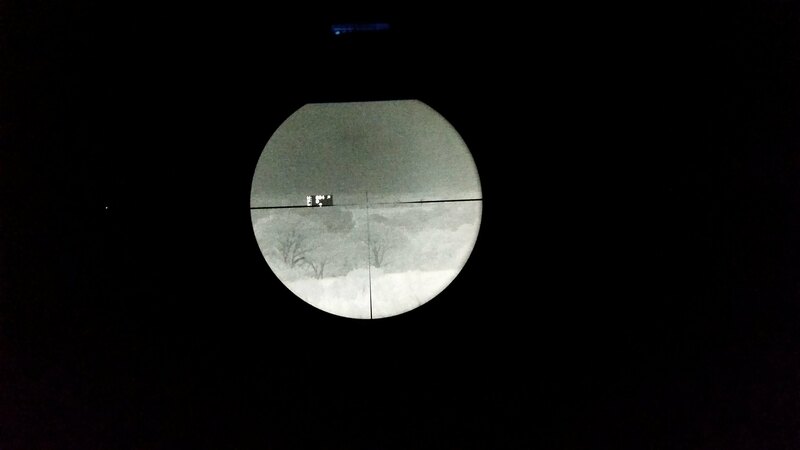 I've got the new scope on the Grendel. I'm going to zero it at 200, so I can still use the post at 500. I've discovered that the difference between the 6.5 and the 6.8 are less than 1 MOA out to 500 yds. They diverge past that point. Vortex has a nice ballistics calculator on their site. I've found it more useful than many of the ones I downloaded to my phone. If I do something awesome, I'll get some pics out. Check your friendly ballistics calculator. When I am hunting with a gun, I zero at 50yds and that gives me a double zero at close to 200yds ... though exactly where the double zero is depending on the ammo and the barrel etc. But check where your double zero is and act accordingly. Over the past two weeks, I've been testing this range finder. This ranger finder has so many features, I don't want to list this all out, as I don't want this review to be too long . Of course the Radius shown price probably averages around $600, but the VSO and the RAPTAR S/ES are ballistic ranger finders, whereas the Radius is just a range finder. Unlike the RAPTAR, the VSO does not have an aiming laser or an illuminator, it is a range finder only, like the Radius. The RAPTAR ES, RAPTAR S/ES and RAPTAR S all have 1550nm ranging lasers. The model of VSO I tested has a 960nm, though a "mil-spec" version is available which has a 1550nm. The "mil-spec" version has a shown price of $7,000. 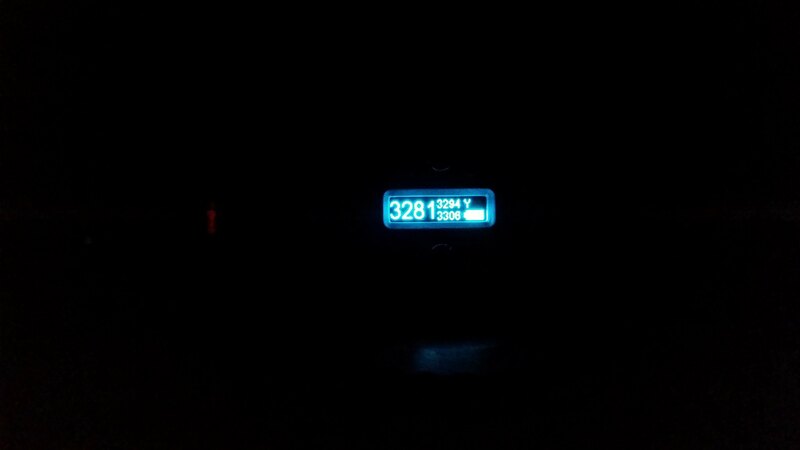 Power - the VSO takes 2xc123 batteries. I ran it all night two different nights. It lasted 19 hours one night and 18 hours the other night. 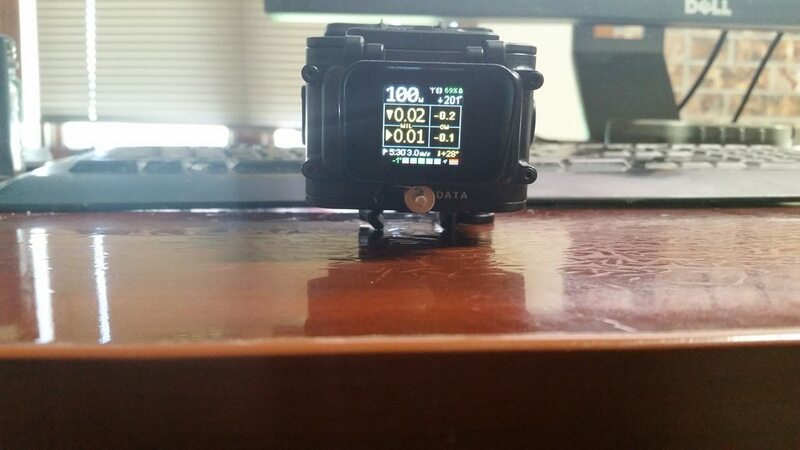 This display has a color mode and a black on white mode. I ran it mostly on white (letter) on black background. But on the day it only lasted 18 hours I ran it longer in color mode. But, the good new is that it will last all night. Repeatability. I ran it on a spuhr COAX mount (designed for the RAPTAR). I removed it and remounted it several times and it retained zero. I used a larue rail clip to help ensure I got it back in the same rail slot. First zero your rifle at 100yds. Set the zero stop and ensure the elevation turret is at that zero stop. You are zeroing the range finder to the 100yd zero and all ranging must be done with the elevation turret set to the zero stop. 02 - Activate vis laser in the house. 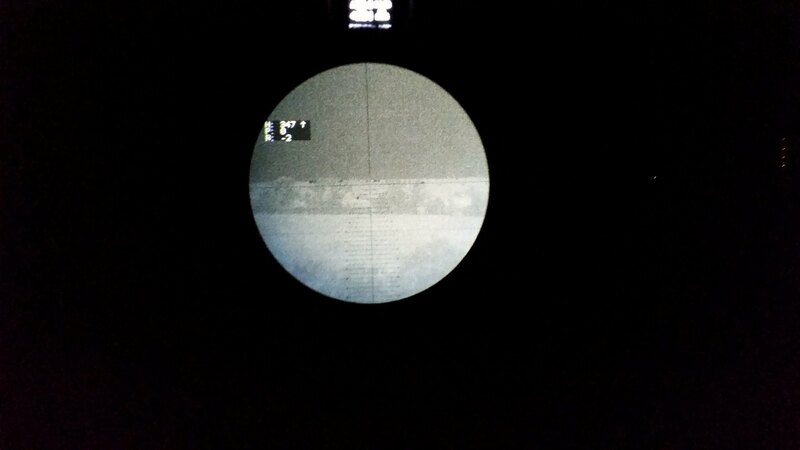 03 - Co-witness to the scope reticle. 04 - Mount the 14 scope adapter and the PVS-14 on rear of scope. 05 - Move everything out side and setup. 07 - Aim at mineral feeder 415 yds away. 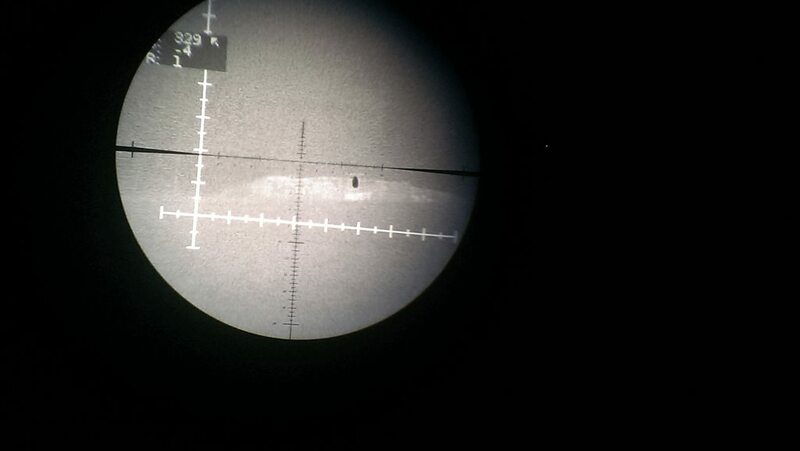 08 - co-witness the laser to the scope reticle. The VSO (and the RAPTAR S/ES and RAPTAR S) integrates to the Kestrel 5700 Applied Ballistics LINK weather station, which I have. the Kestrel can pass the wind reading to the VSO, the VSO displays it on the screen. The distance is in the upper left, the wind in lower left, cant along the lower bottom, compass in the upper right, elevation and wind holds in the center. 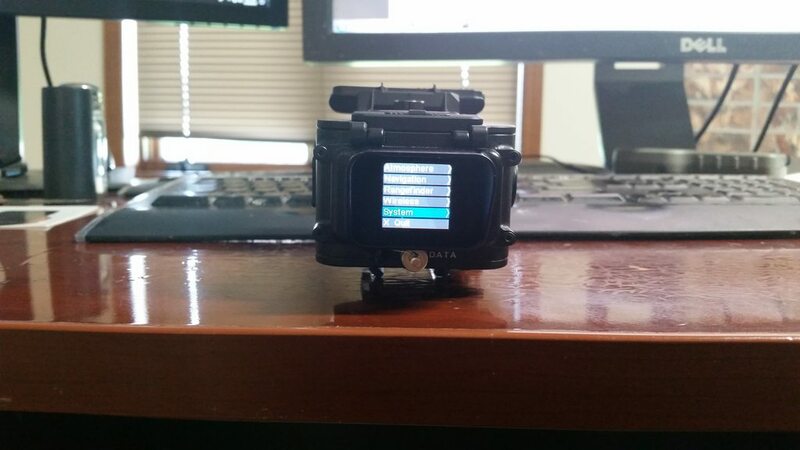 There are many other screens that show configuration information and other views of the data stored in the device. The green^^circles where from the first group. I under estimated the wind. 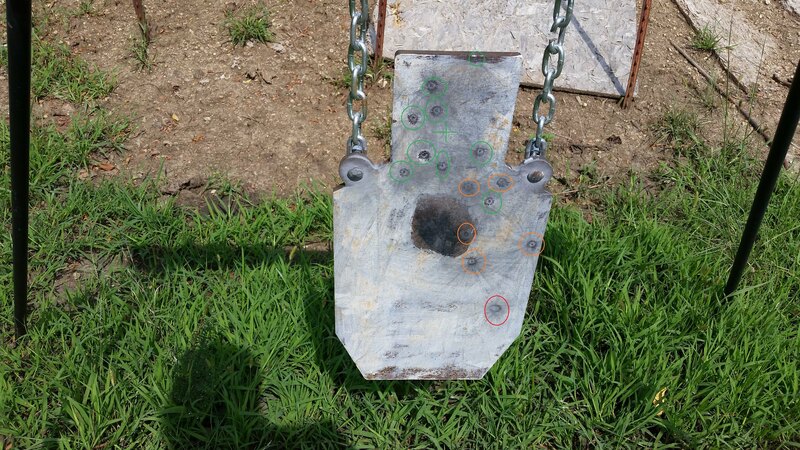 Orange circles are prior group, green circles are second group where I was aiming at the "face" got 7 of 9 hits actually on the face. My Shooter Ballistics calculator said to hold 2.9 and the VSO said to hold 2.88. 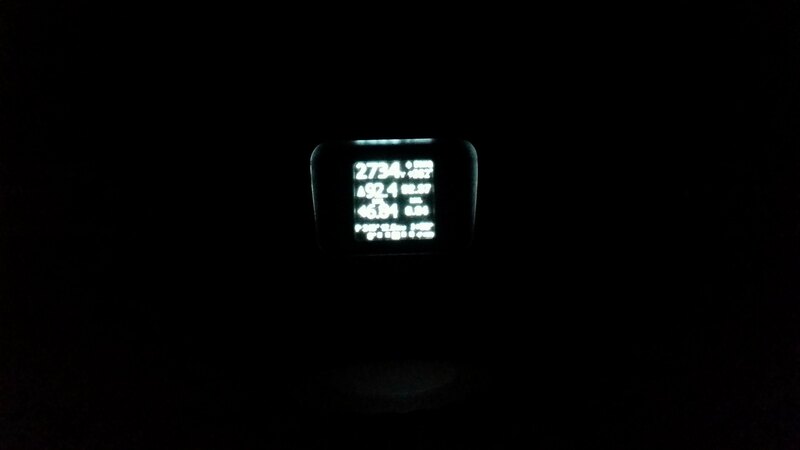 The VSO measured the distance as 497yds which is correct, I was a little short of the exact 500yds FP. But fired 13 rds and got 11 hits off the Manfrotto tripod at measured 499yds and I measured 4 mph wind, but the hits were all right side of target so wind was higher. Ranged cattle in field between half a mile out to a mile and a half on three difference nights. In this pic ^^ the lower group of cows are at avg around 1200yds, the upper group (in a different pasture at a higher elevation) are at avg around 1800yds. I ranged cows in each group for a total of about 24 ranges per group. The farthest range I measured was 2553yds. It has been raining every day/night this week and these ranges were done in light rain. This thing can range. I spent several days in the house comparing the data on the Shooter, my AB in my phone, my AB on the Kestrel and the data in the VSO. There were some issues, but I worked through the all and got AB and the VSO matched up +/- 0.1 mils out to 1,500yds with 3 of my guns. THis thing can do ballistics also. They also talked me down into the factory config menu to adjust another parameter. They have been unceasing in their support and helpfulness, I have never been more impressed with factory support. So, yes, I recommend this device and also believe it is better than the RAPTAR. And TBH, I did not expect this result. I wanted to test it, but I did not expect it would match up. 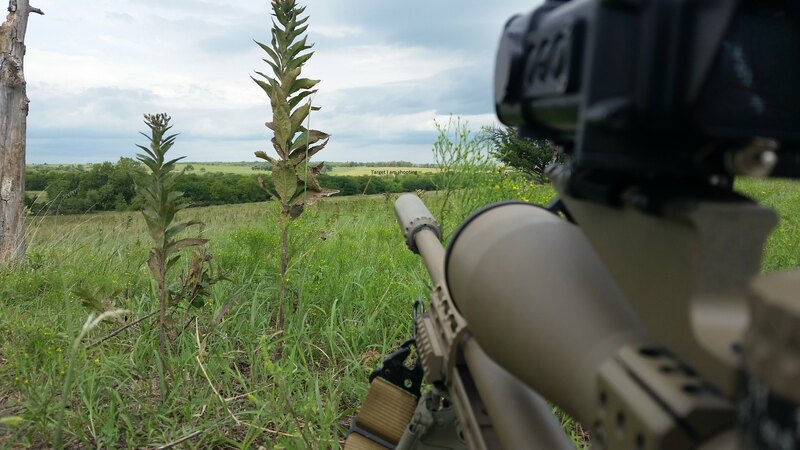 But these guys have build a solid tool and this device can do things no other range finder I've tried can do, such as ranging cow from 3/4 of a mile out to 1.5 miles at night in the rain. Goals: Practicing wind calling, using RRS and VSO. Environment: Solid overcast, misty/rainy, breeze from NE. Equipment: 7.62(22) last rounds of M118LR, NF 7-35x T3, VSO, Kestrel 5700 AB Link, RRS, 4-wheeler. I measured the wind with the kestrel, base 8 mph, gusting to 10+ from 45 degrees off the bullet path. There are 3 steel targets in sight from this position, 2 at 250yds a 1 at 500yds. I planned to fire 1 rd and each hoping for 1st round hits on each. The bull was "roaring" and the heifers were being friendly mostly with the other cows and calves, but were not running from the bull. This could be a problem. We don't want the fence torn down or these heifers impregnanted. But with that for a background, I aimed at the first target, ranged it, go 254yds and the elevation hold, made my wind hold call and fired, hit. Aimed at second target, same process, same result. 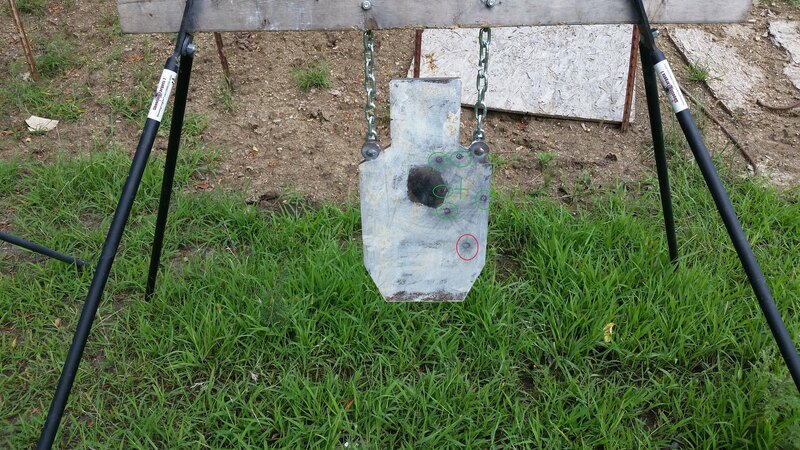 Aimed at 500yd target, got 501, held 8 mph got hit. I could see the splotch on the target, 2 inches low and left. Packed up and moved to to the farthest point I could see the target on the other side of the creek, setup and ranged 764 yds ... elevation hold adjusted for inclination was 6.27 ... Wind was base 8 gusting to 10-11 ... I held for 4 MPH as I think the creek deflect East winds ... missed ... saw branch fall to the right of the target. Held for 8 mph and hit with shots, 2, 3, 4 and 5. But did not get the 1st round hit. The RRS is a game changer, in that sort of wind, standing with the manfrottos Ive been averaging 50% hits at that distance. I think I can beat 80% now not withstanding the wind. 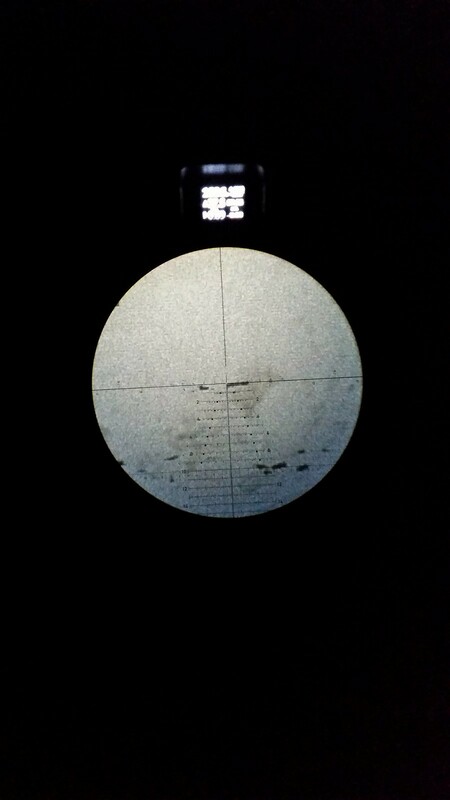 With the manfrottos, the 12 inch steel is covered by the reticle about a third of the time, with the wobble. 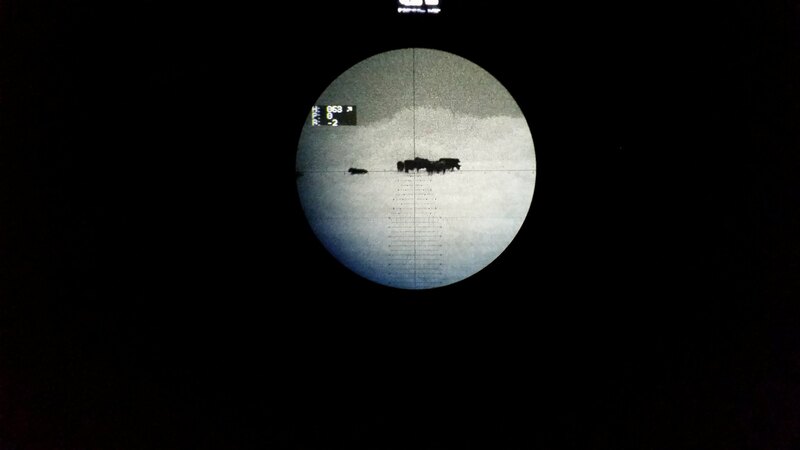 With the RRS, the center that part of the reticle being used for aiming never moved off the steel. 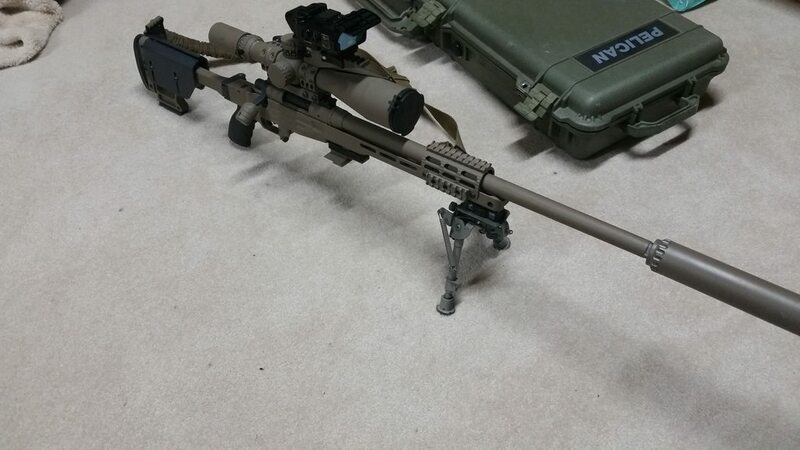 Goals: Test VSO and Radius long distance ranging at night. Environment: Partly cloudy, stars visible, breeze from SE. Conditions dark and dry. Equipment: 7.62(22), NF 7-35x T3, VSO. 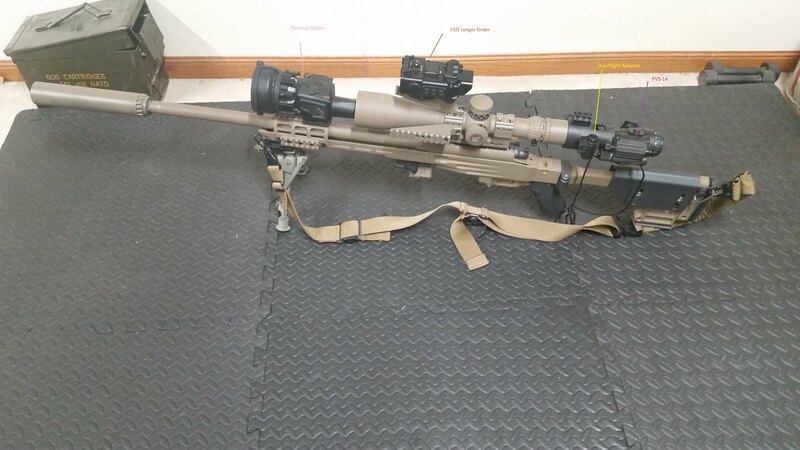 .300WM(24), xtr2 3-15x SCR-MIL Radius. RRS, Buggy. Activity: Rolled up to the top of Signal hill and set up the RRS. Snapped in the 7.62(22). Then ranged someone else's to the NW ... at 2734 ... that's the farthest I could get a ballistic solution ... not that I would make a shot with 92 mils of hold !!! Then ranged the Hill line that stretches from that NE hill those cows were on to the North, then to the NE ... the area where I can see the farthest from my land. And that's 4,847 meters or pretty close to the spec max of 5,000 meters, though informamally Belgium tells me they've ranged with this thing out to 9k in ideal conditions. I would have to go up on top of hills not on my land to range further. Then put the .300WM and the Radius on the RRS for a turn at bat. And as it turned out, that's the farthest I could get with the Radius last night ... I was unable to get ranges returned on the line of hills NW to NE ... tried and tried and tried ... got nothing. So conditions last night might be way better than they've been for the past month ... but still probably not "ideal". This morning we have 100% cloud cover and pretty thick mist and it is almost 9am. When you don't get a ballistic solution with the VSO, you don't see the distance on the main screen, you just see it on the "ranging" screen, which you see before the main screen. I didn't completely realize that until last night, but now I do. And some info on Walker himself. Semiautomatic rifles have been used in some of the largest active shooter incidents in US history.1 The weapons were banned in 1994 under the federal assault weapons ban but were reintroduced to the public marketplace in 2004. So, does anyone see anything inaccurate in this statement?